zynk Design has completed the creation of its third INTENCITY training studio for Fusion Lifestyle, which has just opened its doors at Park Road Pools and Fitness, Haringey. Sitting within the original, traditional gym area, zynk was briefed by Fusion to transform an existing studio into a dedicated, multi-functional training zone which is designed to give users access to a boutique fitness experience. zynk creatively utilised the brand’s distinctive red and black aesthetics to create separate exercising zones within the 100sqm (328sqft) area. This enabled zynk to maximise spatial and commercial potential, generating enough capacity to host five classes of different exercise genres, with up to 16 participants in each. The studio has opened with 30 different high intensity classes each week and aims to increase this to 60 over a phased period. With each INTENCITY class requiring different equipment, zynk worked hard with the space to create easily accessible and safe spaces for kit to be stored in-between classes. Synergy between the old and new gym elements has been achieved by utilising the studio’s existing large window, which provides natural light and enables members to see classes in action. Innovative planning has also created a dedicated studio entrance which provides a cohesive route for students moving in between classes and during waiting times. The striking and distinctive red and black aesthetics of the INTENCITY studio takes its cue from the brand’s concept which centres around participants using their own heart monitors to track effort during each class, with red indicating the maximum amount of effort possible. 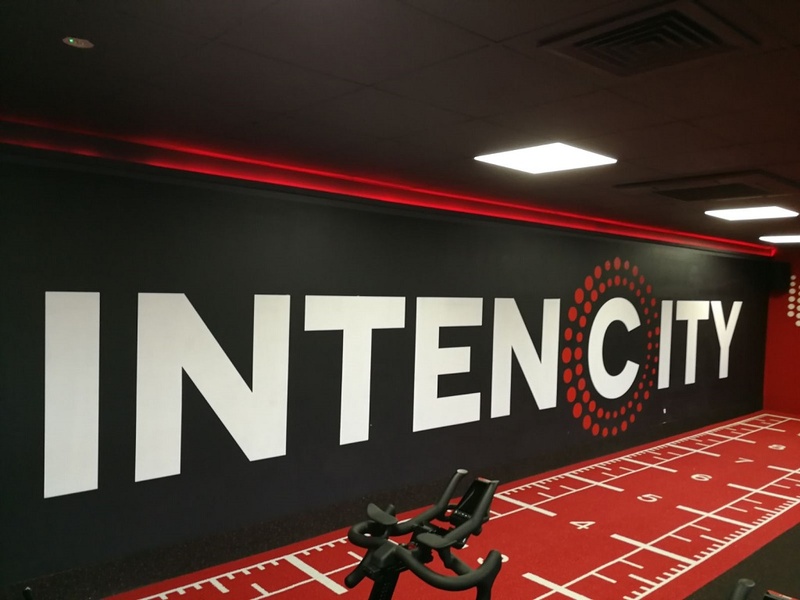 zynk has designed two previous INTENCITY studios for Fusion Lifestyle situated at Southgate Leisure Centre N14 and Robinson’s Pools and Fitness, Bedford.